Born in 1854, Arthur Rimbaud has been heralded as one of the greatest French poets of all time. His poetry, although it predated the movement by a century, was also a source of inspiration for existentialist thinkers such as Jean-Paul Sartre and others. A close reading of Rimbaud’s most famous poem, The Drunken Boat, does much to explain the existentialists’ affinity with this 19th century poète maudit. Rimbaud presents an interpretation of life drawn from his childhood experiences and his first adventures in Paris as a young man of seventeen. The Drunken Boat employs an extended nautical metaphor to describe the journey of life, in which a personified boat serves as the narrator. On the river, the narrator discovers freedom, anguish, and the burden of responsibility, which are the focuses of existentialism. In navigating the predicament that arises out of these three conflicting concepts, the boat becomes an embodiment of anguish. Jean-Paul Sartre discusses a similar anguish in his essay Existentialism Is a Humanism through his debate on authenticity and accountability. In this paper, I will show you how and why The Drunken Boat can be read as an existentialist poem. To introduce the starting point of Sartre’s existentialist theory, a distinction is drawn between humans and objects in that humans are not defined by their function. We are more than our role in society. In Existentialism Is a Humanism, Sartre declares that “existence precedes essence”, meaning that man is first in the world before he defines himself through self-determination (20). Objects, on the other hand, are derived from a model or a concept and therefore are defined solely by their function. Sartre uses the example of a paper knife to explain the difference. He asserts that since the paper knife is produced for the purpose of serving as a paper knife, its function precedes its existence. The essence of the paper knife, its defined properties, enabled it to be produced. The same logic, however, does not apply to humans, who come into existence first and are later defined by their essence. In Existentialism Is a Humanism, Sartre states, “there is no determinism –man is free, man is freedom” (29). We are not pre-determined by our functions but are given the freedom to dictate our own lives. Based on this point of departure, Sartre goes on to argue that, “If, however, existence truly does precede essence, man is responsible for what he is” (23). In other worlds, since we control who we become after encountering ourselves in the world, we are responsible for our defining actions and decisions –our identities. We produce ourselves repeatedly during every moment of being in the world through our choices, but this freedom of choice confers a burden of responsibility. The bestowed responsibility for our actions is then contrasted with the lack of responsibility we have for occurrences outside of ourselves. Sartre insists that man must accept that his control does not extend beyond himself (35). There is a difference between controlling ourselves in the world and controlling the world in which we live, and, according to existentialism, attempting to do the latter will only end in despair. Similarly, we will experience anguish enough due to the fact that we are tossed into the world without any say in the matter and must be in the world without ever choosing existence. Sartre uses the word “thrown” to describe the manner in which mankind comes into being, implying that we have no self-control over our existence, only over our subsequent essence. In Nausea, another existential essay by Sartre, he refers to this phenomena as the contingency, or happenstance, of human existence (188). In his argument, existence is not a necessity. Sartre then expands the experience of anguish due to this contingency include all people “who have borne responsibilities”, and therefore asserts that everyone is subjected to this facet of our situation (27). If people do not seem to experience this anguish, Sartre says that they must either be hiding it or trying not to face it, and therefore are acting in bad faith (25). Anguish is an unavoidable part of the human condition. Giving further dimension to the world into which we are flung, Albert Camus, another existentialist theorist, refers to it as the “absurd” in his essay The Myth of Sisyphus. He argues that everything in the world, due to its “ridiculous beginning” and “abject birth” is absurd (448). Furthermore, he advocates revolt as the only answer to the absurd, saying, “Thus I draw from the absurd three consequences, which are my revolt, my freedom, and my passion” (487). This is to say that we must not be the playthings of fate and surrender to the absurd, regardless of the anguish of the human condition and the limitations of human control. We must consciously revolt and rage against the absurd, though it is difficult, and live on through any means necessary. In order to understand The Drunken Boat, one must have an understanding of Rimbaud’s life, as the poem is heavily influenced by his experiences. Wallace Fowlie, a Rimbaud scholar, asserts that “Le Bateau ivre is a complete intellectual and spiritual autobiography. All of Rimbaud’s past is in it…The genesis of the poem is quite literally the poet’s life…” (Fowlie 30). Much of the poem’s imagery is drawn from Rimbaud’s own memory, and insight into Rimbaud’s childhood explains the tone of impassioned disillusionment. 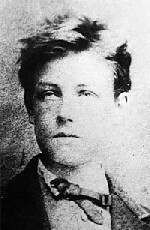 As stated above, Rimbaud was born in 1854 in northern France. He was one of four children born to a largely absent, military father and a distant, unforgiving mother. From a young age, Rimbaud perceived her coldness and became withdrawn, channeling his frustration into his studies. In this way, he developed a love of literature and poetry. By the time he published The Drunken Boat in 1871 –at the age of seventeen –Rimbaud was already an established poet. Within its lines, The Drunken Boat contains attitudes and images reflective of Rimbaud’s childhood. For example, the nauseating movement of the boat on the waves may have been drawn from Rimbaud’s experiences in a rowboat near his school. Also, Rimbaud’s poetry reveals profound disillusionment, which seems to have grown out of his loveless young life, and an equally profound skepticism of authority, namely his parents. At the same time, his adventurous and exuberant spirit, exemplified by the fact that he traveled frequently on his own to Paris, often against his mother’s wishes, comes through especially in The Drunken Boat (Fowlie 13-16). Both of these attributes, the disillusionment and the thirst for adventure are reflected in the poem, and can also be seen as presciently existentialist. Starting with the first five stanzas, The Drunken Boat speaks even more profoundly of existentialist tenets, especially facing the absurd, through the use of an extended metaphor. For instance, in the first stanza, the river is a symbolic microcosm of the indifference of the larger world. The river is described as “impassive”, implying that it is not concerned about the state of the speaker, the boat (Rimbaud 1). The speaker, who admittedly feels lost and disoriented without the guidance of the haulers, cannot rely on the apathetic river to supply a purpose or to direct his adventure. The boat rocks and floats aimlessly, like a drunken man stumbling, and in his interpretation, Fowlie argues that the boat is a symbol of an inebriated poet who has been freed from worldly conventions (Fowlie 31). Thus, the boat is a poet and the river is life, which he must navigate in his drunken stupor. The drunkenness of the boat is significant in that in this state, the boat is paradoxically conscious. In his stupor, the narrator is capable of escaping from worldly conventions and is awakened to discover his place and purpose. Without the liberating effects of alcohol, the boat would still be chained to what society dictates for him. He would be restrained by the other and would not be able to adhere to the existential doctrine of controlling his own destiny. Regardless of the drunkenness, however, the navigation is difficult as it is, and the speaker must confront his position in the world. The main conflict is whether or not the speaker has any control over his movement in the water –whether or not he is completely subjected to the currents and tides that govern the world. The aimless drifting of the boat, and the absence of constraint that comes with the lack of haulers, is reminiscent of our own lack of purpose. The notion that we are not born into this world with purpose is a fundamental tenet of existentialism for Sartre and others. We merely exist in the world. In The Drunken Boat, this lack of purpose, however, comes coupled with a sense of responsibility. And therefore, according to Sartre’s argument, the boat must feel anguish “of the kind experienced by all who have borne responsibilities” (Sartre 27). The idea that mankind must feel anguish in grappling with the harsh indifference of a meaningless world is another important discovery of the existentialist perspective. Sartre’s understanding of anguish and forlornness, derived from the fact that God has abandoned our world, is that we are forced to either face the absurdity of contingency or forever despair as we search fruitlessly for unity and purpose where there is none. Man must carry the burden of responsibility for his own destiny and what he becomes. In this way, The Drunken Boat resonates with existentialists in that the boat has neither a sense of direction nor an assigned place in the vast river, and is responsible only for governing itself in the world. In the second stanza, the speaker himself is called “indifferent” as well (Rimbaud 5). This indifference is in respect to his crew and can be taken literally to mean that he has lost his crew members and cargo to the river’s turbulence. He is therefore independent, unhindered, and self-sufficient when it comes to navigating the river, and with that independence comes a degree of freedom. The speaker maintains that he dictates his own movements in the water, but in reality he is only struggling against the natural absurdity of the river. The line, “The Rivers let me go where I wanted,” alludes to this apparent freedom (8). In this way, when applying this train of thought to the macrocosm, we have both the responsibility and liberty to choose the course of our lives. However, in true existentialist fashion, we are only capable of convincing ourselves of our autonomy when the disorder of the world unceasingly whips around us. Since man is powerless to control the irrational world, it is up to him to either despair over his powerlessness, or to confront the absurd and accept the world as it is. In Sartre’s words, in order to avoid despair, he must realize that “From the moment that the possibilities I am considering cease to be rigorously engaged by my action, I must no longer take interest in them, for no God or greater design can bend the world and its possibilities to my will” (35). In this way, the speaker must then give up all desires to conquer the river, which he will do later on in the poem. The boat cannot do anything to change the river and must surrender to it, though it does have the autonomy to affect itself now that it is free from the haulers. The unemotional conception of the world to which The Drunken Boat seems to adhere reflects Rimbaud’s precocious awareness of the human condition, which he first discovered with despair in his mother’s indifference. The storm blessed my sea vigils. The expressions of blessedness and light-hearted dancing connote excitement and gaiety, which are derived from the boat’s dangerous, yet exhilarating, journey. By going so far as to say that he does not miss the beacon of the lighthouses to provide a reference point, the speaker therefore delights in his disorientation as well. There is a sense of defiance and vigor associated with the boat’s being in the raging river and engaging in its surging vitality. The boat’s complete liberation and immersion in the absurd is accomplished in the fifth stanza when the boat imbibes the “green water” of the river, becoming fully integrated into this symbolic world (18). The river washes away the rudder and grappling hook, or anchor, and thus the last vestiges of control are lost. Symbolically, the speaker is no longer able to steer and cannot secure himself to anything substantial. The image of the shell of a boat bouncing alone on the waves is the epitome of being subject to the winds and the whims of the world. These first five stanzas, which are often grouped together as the basis for the rest of the poem, find resonance a century later in the writings of Jean-Paul Sartre. For example, in Existential is a Humanism, Sartre asserts, “This is what I mean when I say that man is condemned to be free: condemned, because he did not create himself, yet nonetheless free, because once cast into the world, he is responsible for everything he does” (29). Like the boat, man, in general, did not create himself but is cast into the world and still responsible for his actions. Condemnation comes from the fact that the freedom to dictate one’s future is accompanied by a responsibility for one’s actions as well, despite having no input into one’s own creation. We are simply placed into the absurd world and are powerless to rage against it without despair. Therefore, the idea that one can find peace and joy in surrendering completely to the absurdity of the world is found in the paradoxical liberation and disorientation of the boat. And, in the next section of the poem, Rimbaud’s nautical imagery highlights the beneficial experiences gained by the speaker as a result of his yielding to the river. From the sixth stanza through the fifteenth, the speaker describes the sights encountered while on his uncharted adventure, giving an idea of the myriad of experiences in life. In Fowlie’s analysis, this section “relates the boat’s discovery of the universe: its splendor, its giganticism, its violence” (32). For instance, the narrator encounters the magnificent sights of “the low sun spotted with mystic horrors” (33) and “Avalanches of water in the midst of a calm” (51). The Drunken Boat even gives examples of the speaker’s feelings upon finding natural phenomena like the colors of the sky at sunset and the movement of the water. Words such as “Devouring” (23), “exalted” (31), and “dazzled” (37) imply a sense of wonder and allude to the glorious immersion in sensation we undergo if we allow ourselves to become “bathed in the Poem / Of the Sea” (21-22) However, this newfound and wondrous freedom is then met with a horrible realization in the sixteenth stanza. The speaker’s freedom is eventually a predicament and he is forced to reflect on how “Freedom in excess may easily incarcerate a human spirit”, to use Fowlie’s words (32). Incarceration of the spirit weighs heavily on the boat and in this stanza, there is an obvious change in tone. “Weary”, “sob”, and “dark” evoke the feeling of a depression and helplessness which culminates in the image of the speaker as a “woman on her knees” (61-64). This dejection and submission points to the burden that accompanies the type of freedom earlier embraced by the boat. Instead of the “flock of doves” seen in the eighth stanza (31), the seventeenth debuts contrasting “noisy birds with yellow eyes” (66). Evidently, the speaker is becoming rapidly disillusioned with the carefree nature of his adventure. Perhaps, one could go so far as to claim that Rimbaud himself had grown weary of going wherever life would take him. In terms of existentialism, this phenomenon could be related to the notion that man still has a responsibility to act and must commit himself to his choices, as asserted by Sartre in Existentialism Is a Humanism when he says, “…man’s destiny lies within himself” (40). Thus, man is in complete command of his chosen actions and their outcomes, but only those that are internal. He has no command externally. There is a balance: man cannot control the world, but can and must control himself while being in the world. Acrid love has swollen me with intoxicating torpor. This realization confirms the belief that there is no use in weeping over that which cannot be changed. The world is inherently indifferent, beautiful, and cruel, so the speaker still cannot find reason to rage against it. Here he experiences a different type of existential anguish at the fact that there is nothing in his power that can control the river yet he must carry on all the same, despite welcoming the idea of drowning. This recognition of priorities affirms Rimbaud’s personal belief that “the world is both man’s fortune and his peril. To conquer the world inevitably involves a self-defeat” (Fowlie 34). The speaker is thoroughly defeated at the end of the poem, and therefore any attempt to overcome the absurdity of the world will eventually crush the human spirit. Therefore, the narrator in The Drunken Boat chooses to step back from the anguish and conflict of the roaring river in favor of a humble existence. The humility of the speaker at the poem’s conclusion suggests that, ultimately, he prefers security to liberty. In summary, Rimbaud would therefore choose a simple and logical world over the nonsensical and complex reality. He would prefer to have limited freedom if it meant not having to be at the mercy of an indifferent and dangerous river. The existential anguish, to retrospectively name this feeling, is unbearable for Rimbaud. Thus, the existential debate which The Drunken Boat explores serves as an argument for living on in spite of the contingency of our existence. 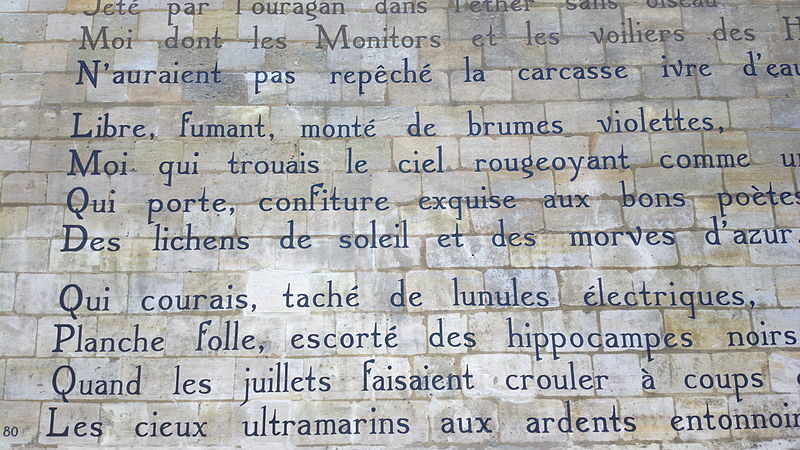 Throughout the poem, Rimbaud acknowledges the responsibility we have for our fate, the anguish that comes with facing the absurd, and the difficulty of living in good faith. Furthermore, the speaker creates a purpose for himself and is obliged to still take action in the face of his hopelessness. In the end, he cites security as the means through which he will confront the absurd, but he revolts against it nonetheless. Also, the idea that the world is an absurd and irrational place, and that man is powerless to extend his control beyond himself, as asserted by Rimbaud, is the same doctrine adopted by the existentialist movement. Therefore, thematically, The Drunken Boat can be read as an existential poem. Even though Rimbaud most likely did not influence the creation of existentialism as a theory, his poetry spoke to its key proponents on a visceral level. Hence, Rimbaud is retrospectively an important voice of the existential movement and his poetry serves as a shining example of the struggles of living an existential life. Camus, Albert. “The Myth of Sisyphus.” Basis Writings of Existentialism. Ed. Gordon Marino. Modern Library, 2004. 441. Print. Fowlie, Wallace, Wallace Fowlie, and Arthur Rimbaud. Rimbaud. [Chicago]: University of Chicago, 1966. Print. Photo of Rimbaud. Digital image. Arthur Rimbaud. Poets.org, n.d. Web. <http://www.poets.org/poet.php/prmPID/1268&gt;. Reproduction Du Bateau Ivre D’Arthur Rimbaud : Rue Férou. Digital image. N.p., n.d. Web. Rimbaud, Arthur, and Wallace Fowlie. Complete Works, Selected Letters. Chicago: University of Chicago, 1966. Print. Sartre, Jean-Paul. Existentialism Is a Humanism = (L’Existentialisme Est Un Humanisme); Including, a Commentary on The Stranger (Explication De L’Étranger). Ed. John Kulka. Trans. Carol Macomber. New Haven: Yale UP, 2007. Print. Sartre, Jean-Paul. Nausea. Tran. Robert Baldick. Penguin Books, 1965. Print. Total Eclipse. Dir. Agnieszka Holland. Prod. Jean-Pierre Ramsay-Levi. By Christopher Hampton. Perf. Leonardo DiCaprio and David Thewlis. New Line Cinema, 1995. DVD.